French and Polynesian inspired resort. This resort is located 5 minutes from the airport, so it is away from the air traffic. It has a variety of room categories including garden view and ocean view as well as overwater bungalows. 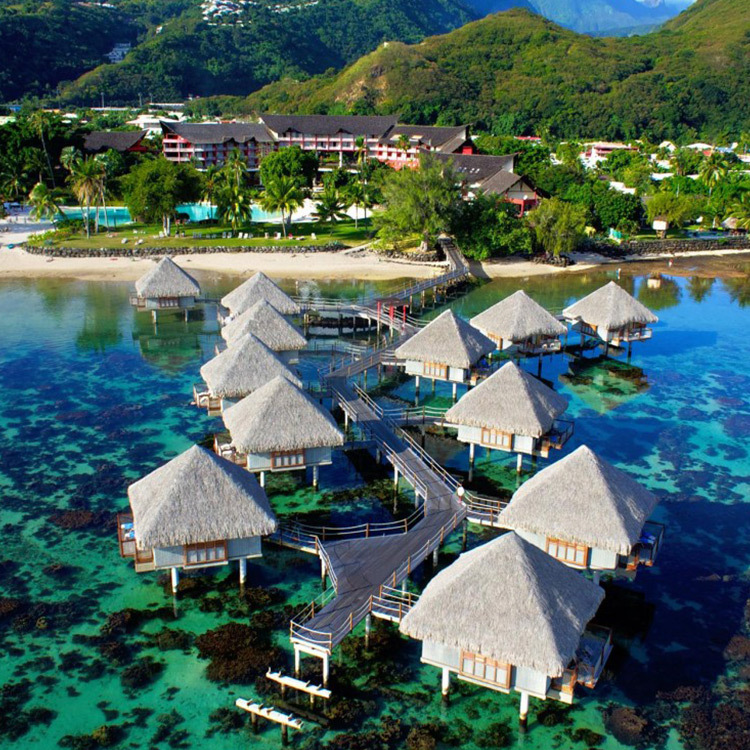 With its typical Polynesian Architecture and unique location on the island, Le Méridien Tahiti is the perfect place to stay in French Polynesian and awake your sense. Our 149 rooms, suites & overwater bungalows will offer you the best in comfort with our “Le Méridien” Beds. Come and Live a unique and traditional Polynesian experience at Le Meridien Tahiti. Taste the unexpected and share unforgettable moments with a Moorea Island view in our restaurant Le Carré. Find in Le Méridien Tahiti, something you weren’t looking for. Overlooking the South Pacific Ocean and 10.8 km from Fa’a’ā International Airport, this bright resort hotel is 3.7 km from Le Lagoonarium. Airy, relaxed rooms feature en-suite bathrooms, balconies, and flat-screen TVs, as well as Wi-Fi (surcharge), coffeemakers and iPod docks. All have lagoon or garden views. Suites add separate living areas or private furnished terraces. Complimentary activities include kayaking and snorkeling. Dining options range from a gourmet French restaurant to an international buffet-style eatery, and there’s a bar beside the sand-bottom pool. Other amenities include a tropical lagoon and spa treatments (fee).